If you're relying on the modem/router you got from your ISP to broadcast Wi-Fi across your house, you may find that in certain areas you're getting slow, unreliable or even non-existent connections. Wireless range extenders and repeaters, such as the Netgear WN3000RP Universal Wi-Fi Range Extender used to be the preferred solution for Wi-Fi woes, but they have fallen out of favour recently due to a fundamental flaw in their design. They would be placed where a Wi-Fi signal was weak, take the signal and then amplify it to boost the range and speed of the network. The problem is, the boosters would be working with an already weak signal, which meant that they would struggle to give the wireless network a meaningful boost. The Netgear Powerline 500 WiFi Access Point, however, avoids this problem by using the mains powerlines in your home to carry the network before turning it into a wireless signal. 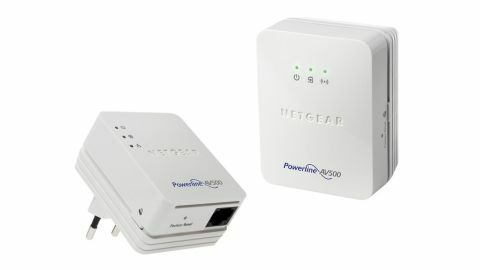 All you need to do is plug one of the adapters into a wall socket near your modem or router, and connect to it via an Ethernet network cable (two are included in the box with the Netgear Powerline 500 WiFi Access Point kit). Then, place the other adapter anywhere where your wireless network is struggling to reach in your home - as long as there's a plug socket. The adapter will then create a new wireless network that you can connect to - with perfect strength due to the network being transmitted through the powerline - so you don't have to worry about walls blocking the signal. The distance between the adapter and your modem won't matter too much, though the further away you are, there will be a slight decrease in network speeds. In a house of an average size, however, this won't be a problem. The Netgear Powerline 500 WiFi Access Point was incredibly easy to set up - we just plugged them into two sockets and they found each other straightaway. The Netgear Powerline 500 WiFi Access Point kit does come with a disc containing a setup utility, which is worth using when you first plug in the Netgear Powerline 500 WiFi Access Point adapters, as otherwise they will begin broadcasting a wireless network without any security. The software that Netgear includes is easy to use, and quickly took us through the process of giving our new wireless network a password. On the adapter with the wireless access point, there is an LED light that changes colour depending on the strength of the signal it is getting through the socket. This is a nice touch that can help you choose the optimal place to plug the Netgear Powerline 500 WiFi Access Point in. Another button on the adapter lets you quickly and easily set up powerline security, which is handy for people in shared houses, or flats that use the same power lines. This ensures that network data is only sent between the adapters you specify. In our benchmark tests, however, the Netgear Powerline 500 WiFi Access Point's speeds were disappointing, with just 67.43Mbps recorded - almost half the speeds of the Linksys Powerline HomePlug AV2 Kit PLEK500. It's enough for the internet and streaming standard-definition movies, but for large files of HD media, you'll want something faster. The Netgear Powerline 500 WiFi Access Point kit comes with two small adapters which are easy to place and are unobtrusive. They are easy to set up, and the Wireless N signal the WiFi Access Point broadcasted was strong and fast, though wired speeds left something to be desired. The kit lacks some of the more advanced features that you'd find on more expensive powerline networking kits, such as the Devolo dLAN 500 AVplus, but for the price it is a good - and easy - way to improve your wireless network.